Will the C.I.A. suicide the Kavanaugh accuser? “The Testify Creed” according to Christine Blasey Ford that follows was submitted by a commenter at Breitbart.com. I will not testify in a car….. I will not testify near or far…. This Christine Blasey Ford fiasco is now so extreme that one can’t help but wonder if her CIA handlers are set to suicide the poor lady for maximum psyop effect. Truly, the Left has been commanded by Deep State to amp up this transparent psychological operation like no other black op in U.S. history. They are really going all out! Therefore, it’s evident that this charade will not end well, especially for the star actor like Blasey Ford. Nor will it end well for Sen. Diane Feinstein and Attorney Debra Katz. However, it’s Blasey Ford who is now in great jeopardy. 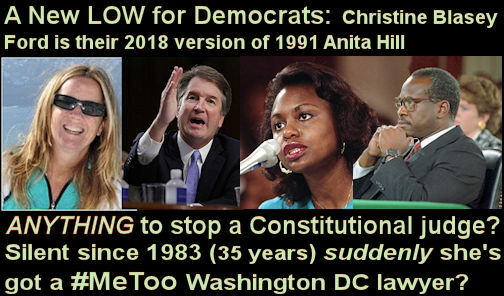 The graphic posted above contains the operative phrase: “Anything to stop a Constitutional judge.” Translation: The Democrat Deep State will do whatever is necessary to prevent the SCOTUS confirmation of Brett Kavanaugh—ANYTHING! Someone, please get the word to the accuser that she is now better off dead than alive as far as her handlers are concerned. No one does projection like the DEMs do. They are like clockwork when it comes to accusing their opponents of the very crimes and corruption that they themselves are guilty of. Where it concerns the present case, it’s quite likely that it was sophomore Blasey Ford who was sexually jilted by a senior (maybe Kavanaugh, maybe not) and she just couldn’t get over it. So much so that she even revised the real history to fit the new narrative of a budding social justice warrior seeking safe space for the rest of her natural life. Wow, you can’t make this stuff up! Now it’s totally understandable why the accuser has been surrounded by a phalanx of attorneys. Her programming could easily break down at any time given the extraordinary pressure being exerted on her from all sides. In light of what’s truly at stake for the cultural marxists, very few could withstand the stress that is about to get even more intense. It’s gonna get really ugly before this op is over!